Hi, all! I know, I haven’t been around for a little while. I’m sorry! No excuses, I think I was just being a bit lazy. I have been cooking, I promise! I just haven’t been so great about taking pictures and actually writing down what I’m doing when I cook. Truthfully, sometimes it’s a struggle for me to write a “recipe” for what I cook. If I’m not baking, I typically don’t use measuring spoons or measuring cups. so I’m not always sure how much of something I’ve added. Heck, sometimes I can’t remember what ingredients I added! The bonus to having to pay attention to ingredients and amounts is that I can recreate those recipes that worked really well. Before I started blogging, there were times when I would create a dish, or I would make a change to an existing recipe that was fantastic! But when I tried to make it again, I could not remember what I did. Anybody else have this problem? 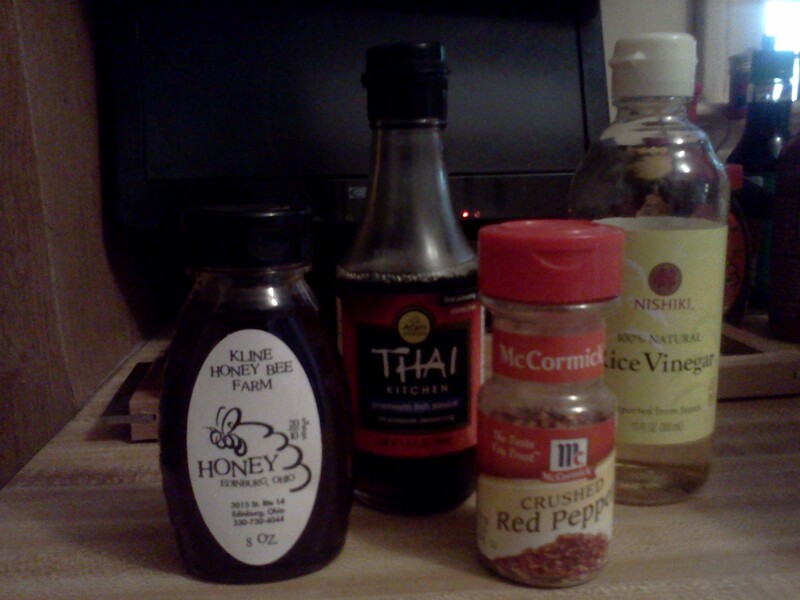 For dinner tonight, I looked at maybe a dozen recipes for stir-fry sauces – and used none of them. I wanted to use the chicken and veggies from Saturday’s farmer’s market, and I really didn’t want to make a grocery store stop. I was sure that I had enough options at home to throw something together. When I tasted the finished dish, I was really glad that I took the time to write everything down! I’ll definitely be making this again. It was filling but not heavy, and it had a good amount of heat, which I enjoy. Plus, a stir-fry works with almost any veggies, which will definitely come in handy when my CSA starts back up! Buckwheat honey is awesome. This is from Kline Honey Bee Farm in Edinburg. Oh yeah, there’s fish sauce, red pepper and vinegar as well. Pepper the chicken. (I didn’t salt it because fish sauce is usually salty enough.) 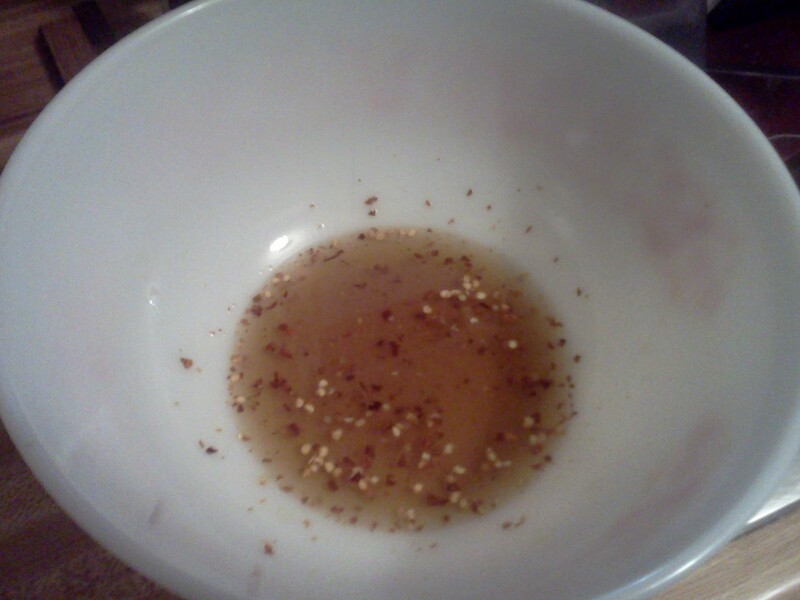 Marinate the sliced chicken in the vinegar, fish sauce, honey and red pepper flakes. I threw the marinade together as soon as I got home from work, so by the time I was ready to cook dinner, the chicken had been in the marinade for about an hour. Before you start cooking the chicken, soak the rice noodles in a bowl of hot water. They need to soak for about 8-10 minutes, so by the time the stir-fry is done, they’ll be ready. If you’re using leftover rice, don’t soak it in water. Nobody wants soggy rice in their stir-fry. 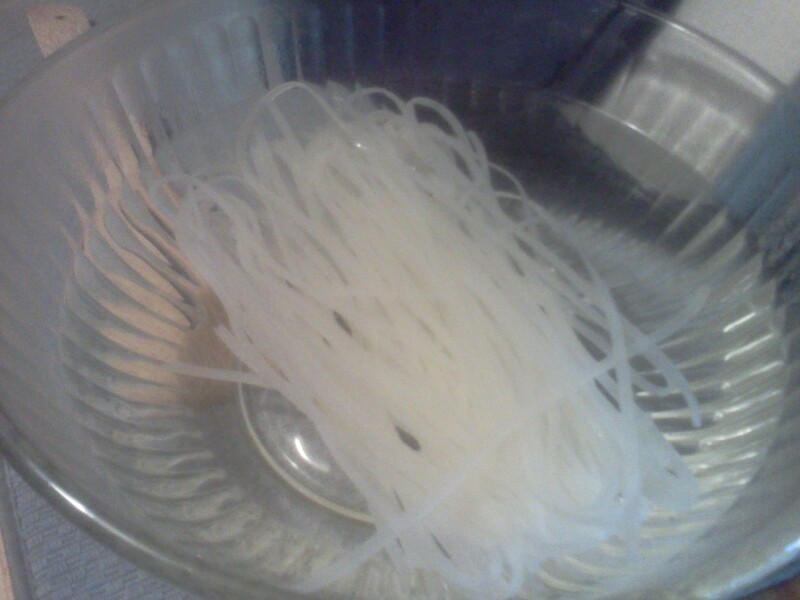 Rice noodles are awesome. There’s no need to boil a huge pot of water…and they’re tasty! Heat a small amount of oil in a wok (or large skillet – I don’t use my wok very often, so I enjoyed busting it out). When the oil is hot, add the chicken in a single layer. Let the pieces brown on one side, then toss in the garlic, asparagus and the bottom, onion-like part of the ramps and stir. (I added the ramp leaves at the end.) Keep the chicken and veggies moving around the wok – you don’t want them to burn. 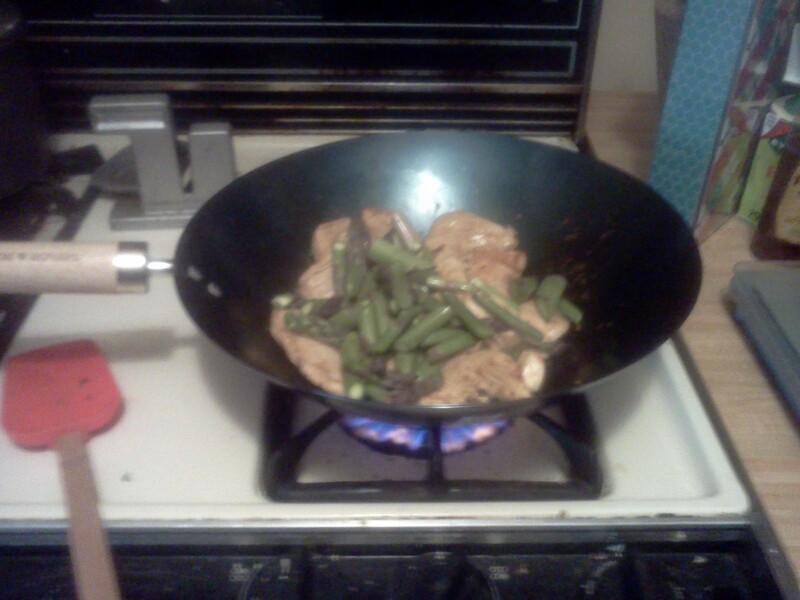 You can see the flame under the wok. Good stuff. After the chicken and veggies have cooked for a couple of minutes, add the red curry paste and chicken broth. Stir everything around to make sure the curry paste is dissolved into the chicken broth and continue to cook for a minute or two. I added a pinch of salt and some additional red pepper flakes here (because I like it hot! ), but taste a piece of chicken or asparagus and do what you need to do. 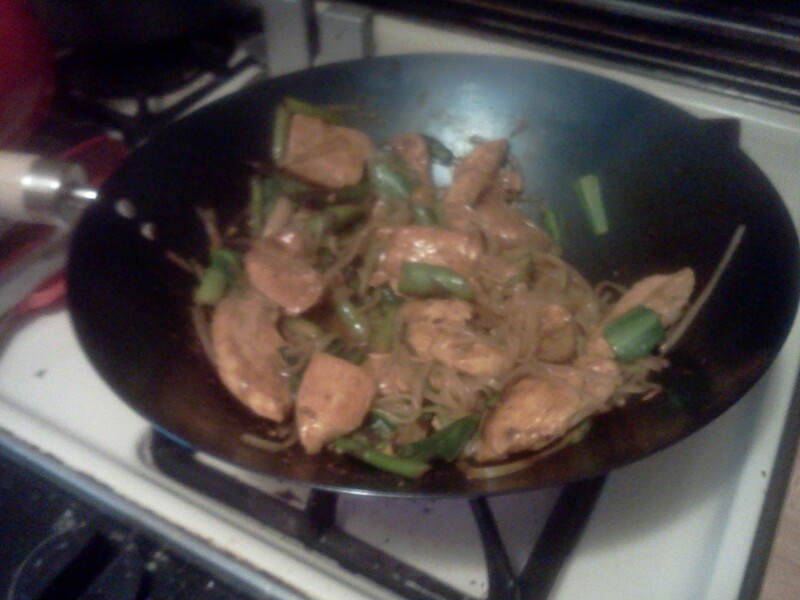 When the chicken is done and the veggies are cooked but still crisp, add the ramp leaves and rice noodles (or rice). Stir everything together, turn off the heat to the work and serve! 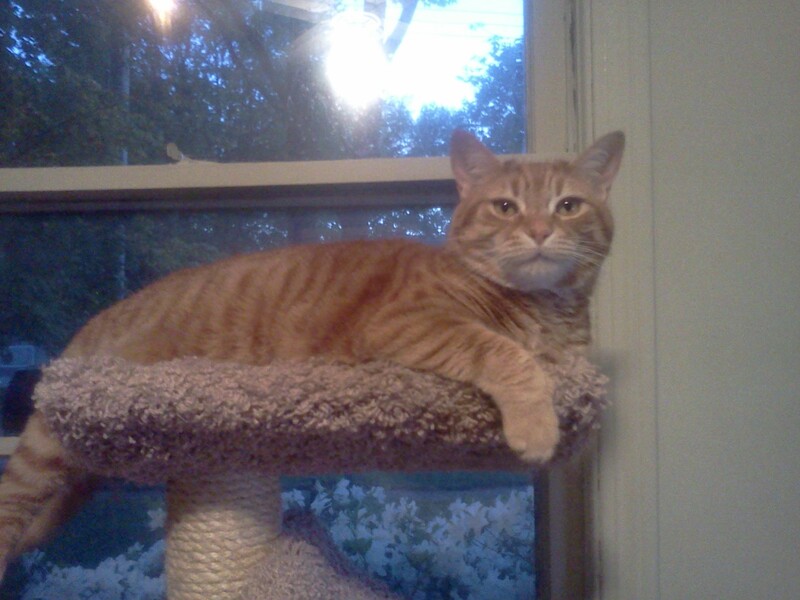 My big orange cat was unimpressed by the stir-fry, but I enjoyed it! Jake was hanging out on the cat tree next to my desk while I typed this. I’m sure he’s wondering why his dinner isn’t on the blog. Fancy Feast, anyone? This post is linked to What’s in the Box? at In Her Chucks. 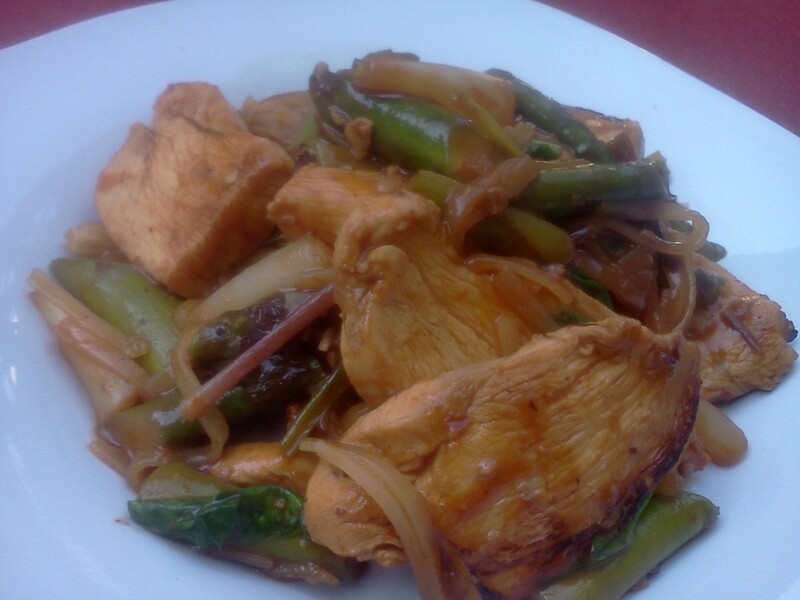 This entry was posted in Dinner, General, Recipe and tagged asparagus, buckwheat honey, chicken, farmer's market, quick easy meals, ramps, rice noodles, stir fry on May 15, 2013 by Melissa. Looks delicious! Makes me want to make a stir-fry too! Also love the picture of Jake! We should have Brandon make us a stir-fry again! Melissa, your stir fry looks wonderful. We were hiking in the woods and actually looking for ramps but I didn’t find any. I suppose I’ll have to hit the farmer’s market if I want to see what they actually look like IRL. And try them, too. I need to use my wok more–right now it sits on top of my cabinets and holds all the utensils that used to hang on the pot rack that doesn’t fit in this kitchen, so I find it easier to use my skillet. But I should use my wok more. Thanks, Kirsten! If you like green onions and garlic, you’ll like ramps. They remind me of a cross between the two. This is the first year that I’ve bought them at the farmer’s market and I’m hooked! I agree , this post reminds me that I should make more stir fry’s. They are usually healthy and quick. The rice noodles are a great idea and something I never think about. Looks great! I love rice noodles, but I’m not sure how Dad would feel about them. If you try them, let me know! I love a good stir fry and this looks great. I also picked up ramps at the famers market and I made pesto with mine. Delicious. I’m horrible at recipe creation for the very same reason. I don’t want to be bothered with writing everything down and measuring it, but it’s worth it when you get a formal recipe at the end. Your ramp pesto looks wonderful. I have some ramps left as well as a large basil plant that needs trimmed back – I may have to experiment! Thanks and have a great vacation!! Looks great! I was going to ask what ramps taste like, but you answered it. Kim had told me that people he works with who are originally from West Virginia bring them to work and say they are “wild onions.” Is that true? This. Looks. AMAZING!!! I have never tried or received ramps in my box but now I plan on searching the farmers markets high and low until I find some. Thanks! I’m trying to buy the things I see at the farmer’s market that I’ve never tried before. So far, so good!